It can feel like motivation is fleeting – it comes and goes depending on our moods and circumstances. You can do things daily to increase the likelihood that you’ll stay motivated. My constant motivation comes from listening to podcasts and reading books. It’s podcasts that I listen to almost every day that keep me so motivated and focused on my goals. Because your environment will never provide you with the consistent type of motivation you need, finding a regular source for motivation is critical to success. That’s why I highly recommend listening to podcasts. I don’t know why more people don’t! Below is a list of the six podcast episodes that have motivated me the most. These podcasts are about motivation, success, happiness, and fulfillment. There’s certainly a place for fun podcasts and news podcasts, but the list below is specifically for motivation. They’re my favs! This episode is about finding your “why”. Andrew Ferebee interviews Dean Graziosi about personal growth and vision. This is the episode that really helped me understand what my “why” is. It has been the one episode to fuel me to keep going. I love this episode and listen to it whenever I need a boost. Make sure you listen to the whole episode – the end is the best part! In this podcast episode, Grant Cardone talks with Andrew Ferebee about finding your purpose. Cardone explains that it’s your duty in life to be successful because it will light you up on fire and make you better in all your relationships. He says, without it you will die. Again, I listen to this episode whenever I want to be inspired. It doesn’t get old! Daymond John talks about his book, The Power of Broke, in this podcast. But it’s not self-promotional – it’s genius. Daymond explains how starting from nothing is the most powerful place to be in because you learn everything at the bottom. As you work your way up this is critically important because you won’t be taken advantage of. You’ll know what real value is and what things really cost. I had a newfound respect for Daymond after this episode. I was empowered and learned something new. It’s a deep and powerful episode. Shawn Achor talks about how happiness directly impacts success in this episode. He doesn’t just talk generalizations – he gives data on how actually being happier will yield results in your work. If you are geared toward negativity or sarcasm, this podcast episode may help you reconsider. Even as someone who really aims to be happy, I had no idea how much my happiness affects my success until I listened to this podcast. Tony Robbins talks with Lewis Howes in this podcast episode about success, wealth, and personal fulfillment. I knew a lot about Tony Robbins before listening to this, but I hadn’t heard him talk. He is unbelievably inspiring. I thought he wouldn’t be able to live up to the hype, but he exceeded my expectations. He talks about his humble beginnings, the importance of giving, and how to be great. This episode is one for the books – it is absolutely inspiring. In this TED talk, Angela Lee Duckworth talks about what makes people succeed. She says that the best predictor of success is not intelligence. It’s grit. “Grit is passion and perseverance for very long-term goals.” I listened to this and said “YES!” immediately. People always say how smart I am for passing the bar, but that’s not it at all. I actually am not amazing academically and work really hard and have a sense of grit that makes me unstoppable in pursuing my goals. If you’ve read Think And Grow Rich by Napoleon Hill, you know what I’m talking about – it’s the overconfidence and persistence to achieve anything. I feel really lucky to have it, and I encourage everyone else to seek it. Podcasts have changed my life. I’m not exaggerating. Because motivation doesn’t last, I need something to motivate me daily. Whether it’s in the car or at home while I’m getting ready, I try to get one podcast episode in every day to keep me focused, motivated, centered, and fulfilled. I highly recommend using podcasts to help you stay motivated! Looking for more podcasts? 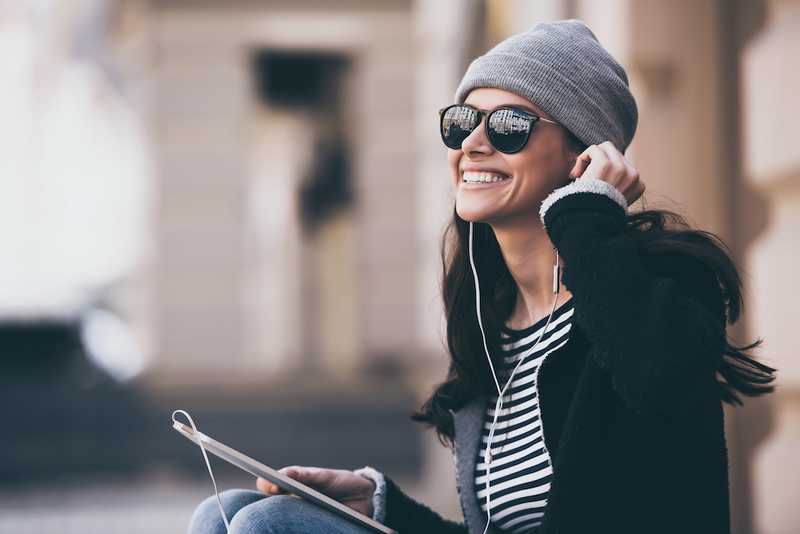 Check out 20 Podcasts That Will Help You Make & Save Money. Thanks for the list! I have made it a priority to listen to less music and more podcasts, especially during my commute. I love making that time productive and there are podcasts on literally every topic and they are free! It’s amazing what you can learn during your commute! I value the time so much more now. Shawn Achor is one of my favs! Sometimes I worry I listen to too much motivational/inspirational stuff and don’t spend enough time executing/implementing. Gotta strike that balance. Whenever I listen to an episode I get so far in the zone that I HAVE to work after I listen. Without listening I wouldn’t learn how to take the action. But for someone who doesn’t take action, I can see that listening too much would be a problem. Hi Natalie! I really do need to get on the podcast train! The only one I have ever given a chance is the biggerpockets one which i love. I am very interested in that grant cardone one though that you mentioned. You are so right…podcasts are game changers. I have a “gazillion”…hope that’s alright to share so many. That’s quite the list gf!! Thanks for sharing! Thank you for these. Please do excuse my ignorance, what is the best site for similar podcasts? I definitely do need constant motivation! I have absolutely fallen in love with the podcast Millennial, by Megan Tan. It is more of a story, but every episode is great, especially if you are a 20 something trying to navigate the crazy 20s. This is a great list! I will have to check some new ones out. Also, I have slowly started listening to a ton of Ted Talks! I’m always looking for some awesome podcasts to keep me motivated to continue blogging, so thanks so much for your recommendations. I’ll definitely check them out! this is a great podcast list!it keeps me going for the whole day…thank you so much for sharing this!